I had a post - Send Snail Mail Online that talk about use internet to create a mail and delivery by postal service. These service are not free, you have to pay stamp for delivery. Today, I like share another mail service with you, it is free in US and Australia. 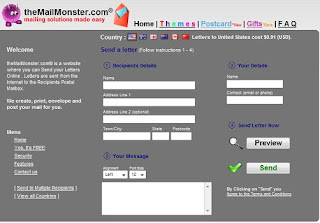 The Mail Monster is a web service that offers an easy way to create a mail online and land delivery. The good point is this service is not only paid mail delivery service, it also offers a free option with ads on your mail. You can create your mail online, and choose delivery modes, free or paid. Free service only for US and Australia, other countries cost $3 US dollars each mail. If you have family or friends live in US and Australia, maybe this is a good service for you. Wherever you live, you can send free snail mail to these two countries now.